On Wednesday 7 November, during the evening, activists of the Welcome! Initiative held a guerrilla action in Cvjetni trg, a square in Zagreb city centre, and at the main Train Station, to raise public awareness of citizens on violence and violations of rights that men, women and children experience on daily basis at the Croatian borders. The action of projecting the testimonies of refugees in public space brought these -too often- invisible refugees’ experiences closer to citizens of Zagreb. Persecution, violence, human rights violations are the reality in which refugees live every day, while their voices mostly remain muted, isolated and ignored. 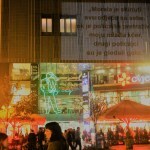 By showing in the very centre of the Croatian capital city the stories and experiences of people who are at Europe’s door, this street action wants to emphasize how these violations and persecutions are systematic, and perpetrated on people that are already underprivileged, which says a lot about the injustice in the whole society. These are just few of the shocking experiences of refugees that have been projected during the night guerrilla action. All the people that were passing by, could not have remained indifferent. The Welcome! Initiative states that it’s up to all of us to participate in building an inclusive and just society based on solidarity. The media space has recently been hysterically misused to spread fear, panic, and disinformation, which is actually the reason why a lot of people are escaping from their country, in search of security. National security is a priority over human security and human rights, with border protection being applied through violence and humiliations. It also boosts the spreading of crime in smuggling activities, as there is no legal way to enter in Croatia. Violent and unlawful expulsions, known as pushbacks, carried out by border police officers, have become daily practice, is being framed under the importance of protection and national security. This is confirmed by numerous reports and testimonies of people whose voices are systematically being muted and discredited. The Welcome! Initiative believes that decision-makers and state institutions are obliged to respect and transparently implement the international laws, regulations and directives that Croatia has accepted by joining European Union. In these moments, more than ever, a solidary and loud response is needed from the society, in order to show our strong opposition to these violent policies that violate human dignity and existence.